1 Spread 2 tablespoons Hellmann's® or Best Foods® Real Mayonnaise on 1 side of 4 waffles. 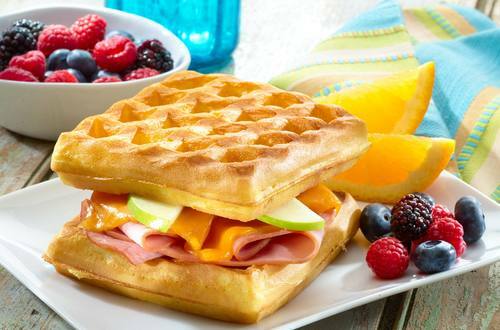 Top with ham, cheese, apples and remaining waffles. 2 Spread remaining 2 tablespoons Mayonnaise on outside of sandwiches and cook in preheated grill pan, turning once, until golden brown, about 8 minutes.